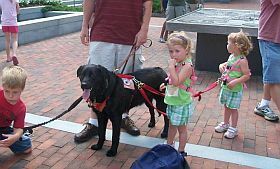 Some agencies that provide autism service dogs assume the child will be able to hold onto the dog's lead at all times, and therefore these agencies do not provide waist belt tethers or harnesses to link the child to their new companion. If your child will be unwilling or unable to hold onto the dog's lead at all times while out in the community, a Waist Belt Tether may be all you need. However, if you know that your child will quickly remove their Waist Belt Tether, they should be wearing one of our Safety Harnesses to use with their Autism Service Dog. The Safety Harness to use with an Autism Service Dog offers the same features of security, strength and durability as our Special Needs Safety Harness. 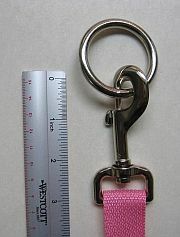 In addition, this design has an O-ring at the front of the harness with a front lead that attaches to the dog's collar. front lead to the dog is attached in a slip-knot style through the front O-ring of the harness. This means your child cannot remove it but you can if you want to use the harness without the dog i.e. as a regular walking harness. parent walking lead is our standard length of 5 feet 8 inches but can be any length you like e.g. 18 inches, 7 ft, 15 feet, etc. The Safety Harness to use with a Serivce Dog is difficult to make and the pricing reflects this. The Mom pictured here is out shopping with her husband (who took the picture) and their twin 6 year old boys. She had ordered 2 Special Needs Safety Harnesses to use with their boys while they waited to receive their autism service dog. She thought the Safety Harnesses might work with the service dog but if they didn't, she would order the other design. Many months later the boys received their autism service dog. And their Mom was right. 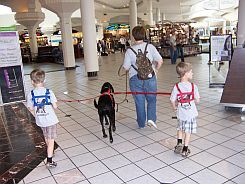 The Special Needs Safety Harness, worn backward so the O-ring is in the front, allowed the boys to be safely attached to their new companion and the entire family can be out together. This second picture is of a little boy who needed an autism service dog to slow him down; he always walked in front of the dog. This was another case where one of our Special Needs Safety Harnesses was all the family needed. They attached the tether for the dog to the O-ring at the back of the Special Needs Safety Harness. 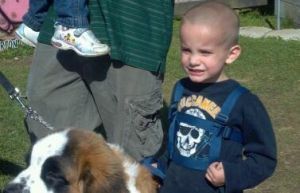 Their little boy walks in front of the dog and the tether keeps the two of them together. This harness is a 2 chest strap design with an O-ring at the back and an O-ring at the front. The lead for the parent attaches to the O-ring at the back with a standard heavy-duty snap hook. The lead to the dog attaches to the O-ring at the front in a slip knot style. This allows you *but not your child* to remove the front lead so you can use the harness without the dog. the harness has 2 chest straps that circle the torso. The top chest strap sits under the armpits, the bottom chest strap sits approximately 3 inches lower down. the chest straps close at the back of the harness with buckles. The buckles can be replaced with Locking Buckles for increased security. the shoulder straps pass through metal rectangle rings at the back of the harness. This allows the shoulder straps to be adjusted. 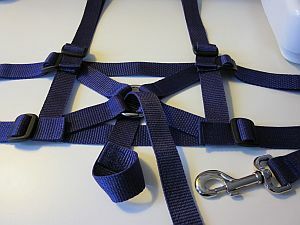 at the back of the harness, the top and bottom support loops and the lead for the parent are attached to a metal O-ring. The O-ring has a smooth, welded seal. The quality of the weld determines the strength of the ring and these rings are rated at 500lb weight capacity. an O-ring at the front of the harness is attached by 4 straps. The 4 straps are anchored at each of the 4 corners where the shoulder straps meet the chest straps. the front lead attaches to the front O-ring in a slip-knot style so you can remove it and use the harness without the dog. The front lead extends to the dog. A snap hook at the end secures the child to the dog's harness. Pictures on our Special Needs Safety Harness page show the chest straps being lengthened on a pink harness with locking carabiners. Adjusting the fit of your new harness is a simple matter of moving the sliders back and forth to shorten or length the straps. The same method is used to change the length of the shoulder straps and the chest straps. 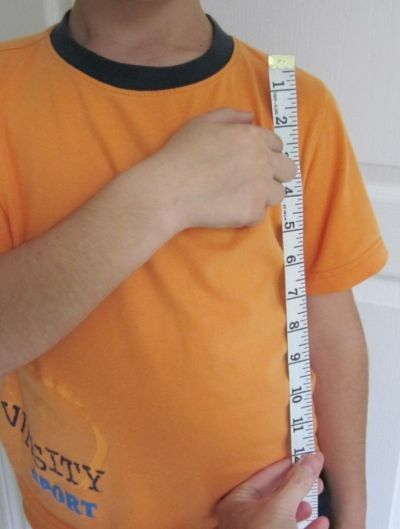 You will receive your harness adjusted to the chest measurement that you gave on your order form. 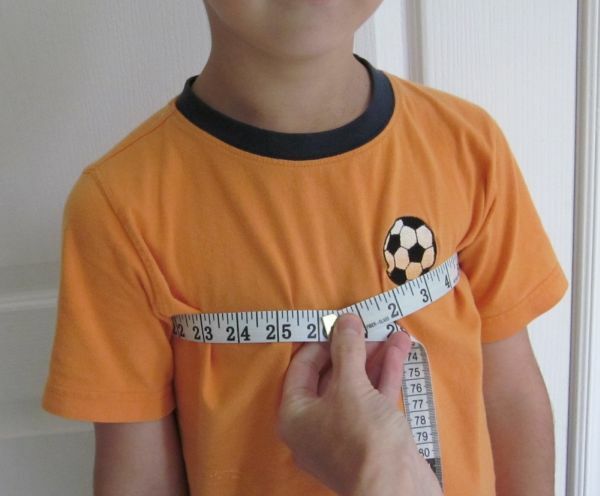 And since you measured your child when wearing a light t-shirt, their new harness will be ready to be worn over similar clothing. This works great in the summer time! 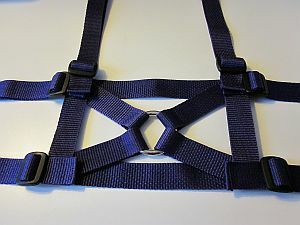 The extra webbing on the harness that you use to make the harness bigger (e.g. to fit over a sweater or a jacket) is between the two sliders on that strap. 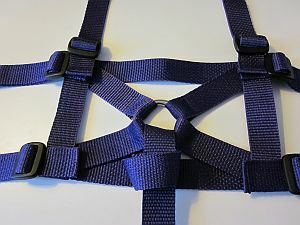 By moving the second slider toward the back of the harness, you "free up" a length of webbing that you then feed through both sliders to make that strap longer. If you put the harness on your child and there is a 2 inch gap between the buckles at their back, lengthen each chest strap by 1 inch. You must lengthen the chest straps evenly so the front panel with the O-ring stays centred on their chest. Lengthen (or shorten) the shoulder straps so the back O-ring sits just below their shoulder blades. The back O-ring is in the correct position if you can buckle the top chest strap through its support loops and the chest strap passes just under their armpits. The Safety Harness should be fitted snuggly on your child - snug, not tight! When fitted properly, the harness will be extremely comfortable to wear and should not be restricting to your child. 2nd child's measurements same as first child/person?